The estate planning process may seem complex and overwhelming, but it doesn’t have to be. James B. Church & Associates, P.C., Attorneys at Law has more than 27 years of experience offering solid estate planning services to people throughout the Redlands and San Bernardino areas. The firm’s attorneys work closely with you in a personal, reassuring manner, answering all of your questions and setting up wills, trusts and other key documents that allow you to uphold your wishes. A good estate planning lawyer is not only about securing the best possible outcomes for clients — it’s also about how easy that lawyer can make the process for everyone involved. The firm focuses on making sure that you experience as little stress and anxiety as possible as you prepare for your future and those of your loved ones. James B. Church & Associates will explain the complex plans and documents in a manner that is easy to understand. Reputation. The team offers sound and easy-to-understand legal advice, backed by its years of experience in estate planning. Additionally, Mr. Church has been assigned by the court to act as trustee, special administrator and guardian ad litem for children and adults who cannot care for themselves. Mr. Church is regularly appointed as legal counsel for those who do not have the ability to speak for themselves. Record of success. The firm has helped countless individuals and families in the Redlands area work through the complex estate planning process. The firm has represented many individuals in their fiduciary capacity as executor or trustee in defense against attack. The firm has also assisted many beneficiaries that have been mistreated. The firm has won some major judgments during probate as well. Exclusive focus. Unlike other practices that offer estate planning as just one of their practice areas, James B. Church & Associates focuses only on this area of the law. The firm’s estate planning lawyers have a set of skills that’s tough to match in San Bernardino County. Openness. These attorneys are interested in you and protecting your best interests, and do not discriminate in who they serve. The firm is happy to work with nontraditional couples and families. 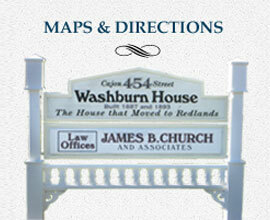 For reliable assistance with estate planning and probate, contact James B. Church & Associates by calling 909-283-0659. You may also contact the firm online. The office is open Monday – Friday, 8 a.m. to 5 p.m., and there is plenty of parking available onsite. The firm serves individuals and families across San Bernardino and Riverside Counties. James B. 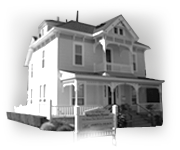 Church and Associates is located in Redlands, CA and serves clients in and around Redlands, Pinon Hills, Bloomington, Big Bear Lake, Green Valley Lake, Barstow, San Bernardino, Fawnskin, Sugarloaf, Colton, Forest Falls, Rialto and San Bernardino County.